Dieng volcano complex is located in the central highlands of Java, Indonesia. 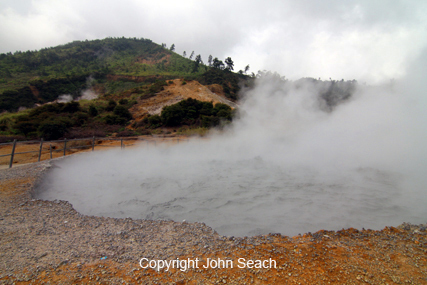 For several centuries volcanic activity at Dieng has been dominated by phreatic eruptions, and geothermal activity (fumaroles, solfataras, mud pools, hot springs). 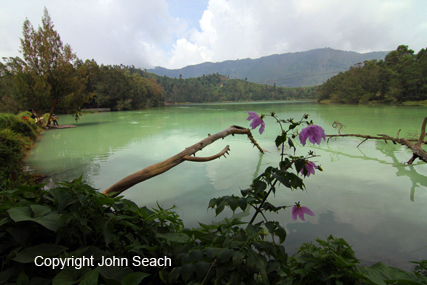 Dieng volcano is noted for the release of carbon dioxide, which sometimes results in fatalities to residents. Carbon dioxide emission can destroy the surrounding vegetation and local people are aware of "death valleys". 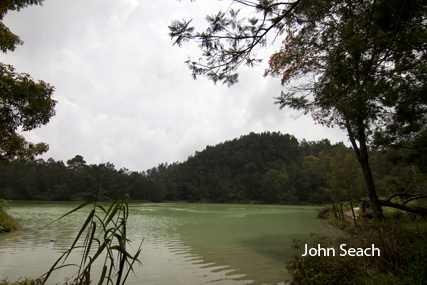 Telaga Warna (crater lake) at dieng volcano 2010. 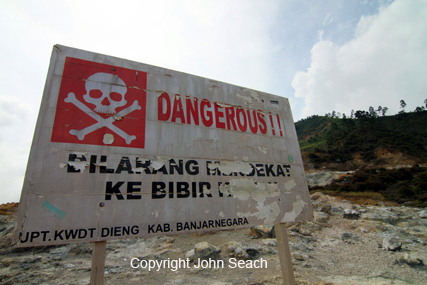 Dieng volcano has a history of deadly gas eruptions. The volcano is composed of two stratovolcanoes (Butak Petarangan and Dieng) and many craters. Warm acidic lakes fill some of the craters. Volcanic cones at Dieng include the following - Bismo, Srojo, Binem, Pangonan, Merdodo, Pagerkandang, Nogosari, Petarangan, Telogo Dringo, Pakuwaja,Kendil, Kunir and Prambanan. Fumarole areas - Kawah Sikidang, Kawah Sigajah, Kawah Kumbang, Kawah Sibanteng, Kawah Upas,Telogo Terus, Kawah Pagerkandang, Kawah Sipandu, Kawah Siglagah and Kawah Sileri. 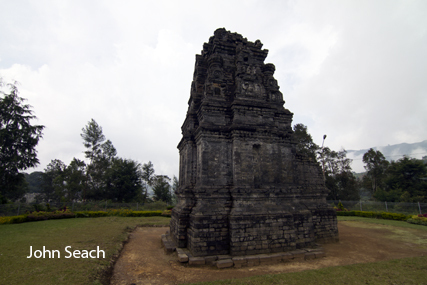 Butak Petarangan is the second volcano located in the Dieng complex. It consists of a crater-lake named Telogo Dringo and Condrodimuko fumarole field. A small phreatic (?) eruption occurred at Sileri Crater, Dieng volcano on 2nd July 2017. Ten out of 17 tourists who were at the crater at the time were injured. A rescue helicopter crashed killing all 8 people on board. Dieng volcano was raised to level 2 alert (Waspada) on 11th March 2013 due to an increase in earthquakes and gas emissions. 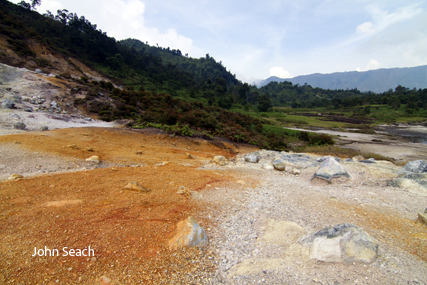 Dieng was raised to level 3 alert (siaga) on 28th March 2013. A 500 m exclusion zone was placed around Kawah Timbang. Gas emissions from Dieng volcano in central Java has forced the evacuation of 1200 residents in June 2011. On 28th May 2011 there was a sudden increase in carbon dioxide emissions at Timbang. On the 29th May there was a felt earthquake at the volcano followed by shallow seismic activity. 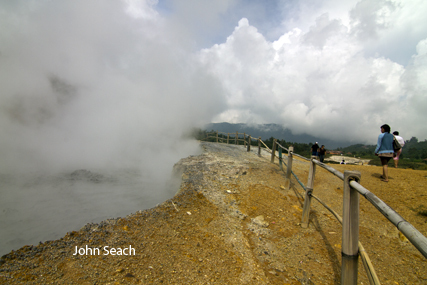 This corresponded to a phreatic eruption at Timbang crater. Dead birds were found near the crater. People are advised to remain at least 1 km from Timbang crater. The alert status hat the volcano has been raised to level 3 (Siaga) out of a maximum 4. On Friday 16th January 2009 Dieng volcano was raised from level I to II alert (out of maximum 4) after two phreatic eruptions on 15th January. The eruptions occurred at Sibanteng crater at 0800 and 0830 hr. Material was ejected 50 m from the crater. 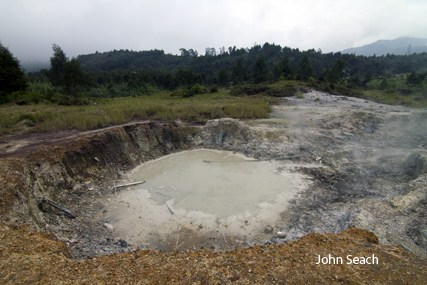 A phreatic explosion occurred at Sileri crater, Dieng volcano, Indonesia on evening 26-27 September 2009. The eruption lasted for 15 seconds. Between 1-19 September there were 2 volcanic earthquakes, 20-23 September 1 volcanic earthquake, 24th September 1 volcanic earthquake, no volcanic earthquakes on 25-26 September. The explosion was heard at a distance of 2 km from the crater. During the phreatic eruption, mud was ejected to a radius of 140 m. Temperature of water in Kawah Sileri remained fairly constant at about 70 deg C. There was no emissions of toxic gas at the eruption site and surroundings. The alert level at the volcano remains at "Normal". No evacuations were ordered. People are advised to stay at least 500 m away from the craters Sileri, Sinila, Timbang, Siglagah, and Sikidang. On 18th March 1992 gas emissions killed one person in a river valley 200 m W of Sikidang Crater. Carbon dioxide emission, accompanying a phreatic eruption from the SW side of the Dieng volcano, killed 149 people on 20th February 1979. Gas emissions contained CO2 and H2S and were ejected from Sinila Crater. Up to 17,000 people were evacuated from six villages near Sinila. Fish and livestock were killed by the eruption. Seven earthquakes were recorded before the eruption. Two lahars were produced from Sinila Crater. An explosion occurred at Dieng volcano on 4th December 1944. Ash-mud rain, covered the villages Kepakisan, Sekalem, Sidolok, Pagerkandang, Djawera and Kepakisan-lor in complete darkness. Ejected blocks reached the village Bitingan 1 km from Kawah Sileri. Fifty-nine people were killed, 38 wounded, and 55 missing. The wounds were caused by boiling mud. A violent phreatic eruption occurred at Dieng volcano on 13th October 1939. The eruptive centre was located on the northern side of the Chinese cemetery. A fissure opened up high up the slope and fountained mud. The activity continued until 3rd November. 2017, 2011, 2009, 2005, 1993, 1986, 1981, 1979, 1964, 1956, 1954, 1953, 1952?, 1944, 1943, 1939, 1928, 1883-84, 1847, 1826, 1825, 1786, 1776?, 1375.